Karyn has been Search Consultancy’s Financial Controller since 2011, after initially joining the company in 2010 as Finance Manager. 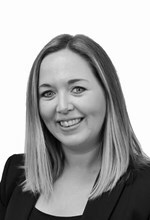 Prior to Search, Karyn began her career as a trainee accountant in the travel industry, qualifying as a Chartered Management Accountant in 2004. She held a variety of roles in accountancy and finance before becoming Group Accountant for an airline in 2008. Karyn is involved in all aspects of Search’s financial management, including overseeing the Staff Payroll, Finance and Accounts Payable teams. Based in Search’s Atrium Court headquarters in Glasgow, Karyn is particularly passionate about the people and teams she works with, who in her view make Search such a great place to work.